Fathers Day is a holiday that falls on the third Sunday in June, and is a day to celebrate everything that your dad does for you on a daily basis. Dad gives so much time and effort to you every day and one day of the year you are supposed to instead give him just as much attention and love. Although I'm sure you give your Daddy a lot of love and time on other days as well because I bet you are a great daughter or son. You should prepare for Father's Day by brainstorming about what you can do for your Dad on Fathers Day to make him feel special and loved. Whether it is making him breakfast in bed, or cutting out little love-hearts and placing them all over his room, or some other great idea. Either way, you should at least make him a Fathers Day card and a gift too...so he knows how you feel about him. Find some inspirational gift ideas below. This craft is to make a home-made Chia Pet - like Dad figure. It isn't so hard to make either. Ask your Mom to save you an egg shell. She will most likely clean it for you...but if not, carefully clean out the egg shell and let dry. Then clean up the edges of the shell to make the tips pretty even. Beak a popsicle stick / craft stick in half (picture #1). Then glue them to the bottom of a toilet paper roll (picture #2). Then balance the egg on the top of the cardboard tube (picture #4). Paint the face on to look like your Daddy. If he has facial hair...it is sort of funny to use felt or yarn to accentuate his features. Add clothes with fabric, felt, lace, butons, beads, or other items. You might want to cut out a felt tie and work coat. After everything is decorated....place some cotton in the eg shell. Then sprinkle with water and add cress seeds. Then put your Dad egg head in a dark place and check on it every day. When you see green straws like grass...then it is time to put it in the light...maybe in front of the window. Every day put some drips of water in the cotton. 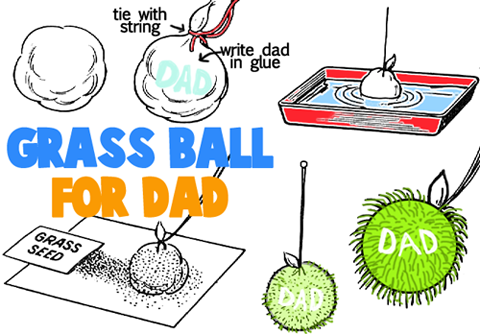 This is a unique idea....making grass grow in a ball shape with the word 'Dad' written on the side of it. Roll a piece of absorbent cotten (about 2" thick) into a round ball and tie string or ribbon around it to keep it in a ball. Then take some glue and write Dad in thick letters in the side of the cotton. Let Dry completely...keeping it flat so that the glue doesn't run (if your Mom is around...have her draw it in hot glue). After this has completely dried, then wet the ball in a pan of water. Next roll out grass seed on a piece of paper. Next roll the ball in the grass seed. The grass seed won't be able to grow on the portion that you wrote 'Dad' on . Make sure that the rest of the ball is covered in the grass seed. Tack the string in a dark closet (in a place your Dad won't look) for two days. Then take the ball out and tack it in the sun. The grass will start to grow everywhere but the 'Dad' place. Give this to your Dad and he can hang it in his office. He will enjoy some grass that he doesn't have to mow. This craft would make a great present for your Dad on Father's Day. You will need a clear glass, as pictured above. Then find some photographs of yourself and cut a few of them out as they will be decorating your photo paper weight. Also cut out letters from magazines to spell out 'Best Dad' or 'Top Dad' or something like that. Then moisten the picture a bit and stick it around the inside of the glas. Now have your Mom mix some patching plaster with water until it is thick. Now turn the glass so the opening is upwards and fill it with the plaster and smooth the top out with a knife...then let is set until it is hard. Now trace a circle piece of felt and cut it out and then cover the top layer of plaster with glue and then with the felt. Your Dad can stick it upside down as a paper weight photo display for his desk. 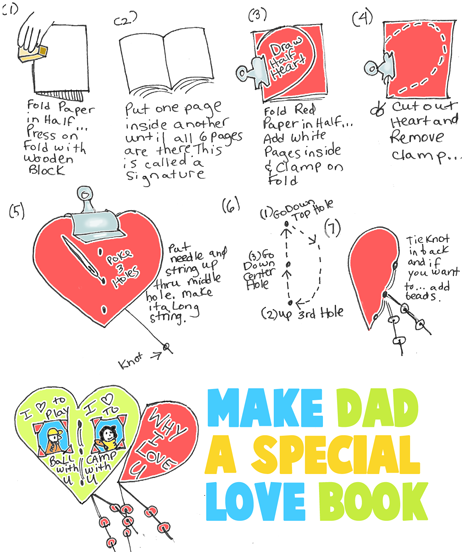 Make your Daddy a special book to tell him not only how much you love him, but why you love him so much. He will cherish this keepsake book forever and ever. Firstly, get 6 pieces of paper, all the same size. Fold each piece of paper in half, then find a wooden block to press down the fold into a nice crease (picture #1). Put one page inside another until all 6 pages are gathered together. (picture #2). Then fold a red piece of paper in the same way and then add all the white (or other color) pages inside the red piece of paper and use a big paper clip clamp to hold them together. Draw a half heart on this paper with middle of heart on the fold (picture #3). Cut out the heart (picture #4). Unclamp the clip. Then open up the heart pages and clamp together at the top this time. Poke 3 holes in the middle of the heart with a needle. Cut a very long string and knot at the end. Put the needle and string up through the back of the heart into the middle hole and pull through until knot stops the string (picture #5). Then (picture #6) shows you how to sew the book's seam. From the middle hole, go down into top hole, and up thru the 3rd hole and again down into middle hole. Then tie a knot in the back and keep the extra strings (if you want to) to add beads on them. Inside the book, draw or add photos of your Dad, you and your family and write on each page a reason why you love him so much. Or, you can tell a story about you and your Dad. Either way, fill this book with all of your love to show your Dad just how special he is. Remove the cork insert from the bottle cap, if there is one. Now trace the cap on some colorful paper. Write something such as ' #1 Dad', 'Best Dad', or something like this. Cut the circle out and paste it inside the cap. Cut out 2 ribbons that are each about 2 inches long. Fasten the ribbons to the back of the cap with either masking tape, scotch tape or if Mom is around, ask her to help you with hot glue. Also attach a safety pin with tape or hot glue (with Mom's help). Show Dad how much you care by giving him this thoughtful present on Father's Day. This attractive pen and pencil rack would be useful at home or in school. Rinse out a flat-top milk container and allow it to dry out thoroughly. With the spout opening of the container at the top, mark off the grooves in which the pens and pencils are placed, with a ruler and a pencil. With a pair of scissors, cut off the top of the container and cut out the grooves. You may cut a piece of fancy paper to fit the rack and glue it in place; you may cut and then glue a piece of plain paper to the rack and decorate with colored wax crayons, or you may paint the rack a solid color and after it is dry paint on decorations or designs. If you paint the rack, run your wet brush over a piece of soap or a piece of raw potato before dipping` it into the paint (or mix some Elmer's glue into the paint). This will prevent the paint from "slipping" off the surface of the container. Firstly, roll a piece of clay into a ball in the palms of your hands. 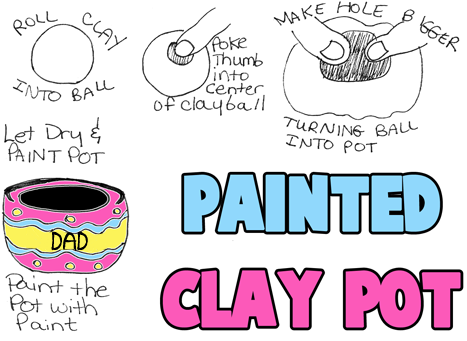 Then poke your thumb into the center of the clay ball that you rolled out. Slowly, make the hole bigger by spreading out your thumbs. Slowly the ball will turn into a clay pot. If you make it with higher edges, Dad can use this for pencils and scissors, etc. Otherwise, your Dad can use it for keys and lose change. My son made one with higher edges and I use it to hold my glasses in. Let the pot dry and then paint your pot with pretty colors. 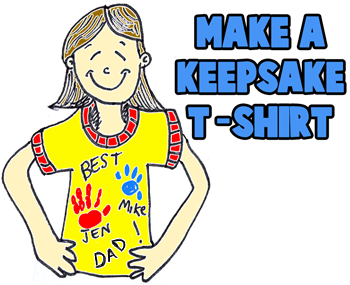 Remind your Daddy that he is the best Dad in the world by making him a t-shirt telling him so. Place a piece of cardboard inside the t-shirt that you are going to paint. Do this so that the t-shirt doesn't get stuck together. Then Have all the kids in the family put their hand prints on the shirt by wetting there hands with acrylic or craft paint and then placing their hand firmly on the t-shirt. You can use a Sharpie Permanent marker to write your names and 'Best Dad' or you can find a fine paintbrush to do the same thing. Dad needs your photo on his desk, right?! So how about getting him a picture that you like of yourself and your sibling(s) and putting it into a beautiful handmade picture frame?! All you need to do is to find a lid, such as a jelly jar lid or a peanut butter jar lid (well washed with liquid soap just in case people are allergic to peanuts at work). After you wash out the lid and dry it well....then use it to trace around your picture. 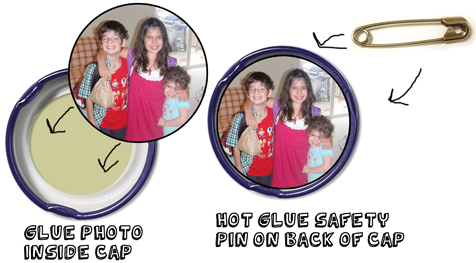 Cut out the picture and then glue it to the inside of the lid. Then cut out some cardboard in a triangle-ish shape. Fold the top of the triangle back. and then glue it to the back of your lid. Let it dry completely. Now, make sure that the photo frame stands up correctly. You can then decorate the frame however you like...if it is a nice lid, you won't have to do so. Now, how about another paper weight craft. If you go to an office, you can always see parents with paper weights on their desk, usually made by their kids. Parents love this stuff. So find a large, oval-ish rock. Wash your rock under some water and let completely dry. Put some newspaper out to protect your painting area. Paint your rock a solid color and let dry completely. Then paint a design or your hand print on the rock. After that Dries you can use a fine paintbrush to write your name, age, year, and a message to your Dad, such as 'Best Dad', '#1 Dad', 'Top Dad', etc. Dad will love his beautiful paper weight rock. Nothing means more to your Dad then you...how about you tell him how much you love him and why you think he is terrific. Fill a jar with loving notes that he can open whenever he is feeling down or under the weather. Notes like ... 'I love You Dad' ... 'You are the Best Dad in the Whole World' ... 'I love when you play ball with me' ... 'You are the best singer' ... 'You make me feel like the best son'...and other beautiful messages to your Dad. 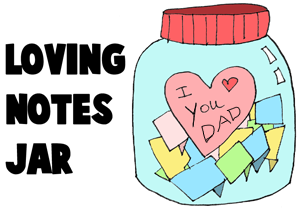 Decorate your Jar and give it to your Dad. You can always add more loving messages when the message jar gets low. By the way, my son gave me one of these years ago and I loved it. These are a lot of fun to make and give. Your Dad will love receiving this. First, cut out a 10" x 24" piece of paper. Fold it forwards and backwards, over and over again, in an accordion fold, as seen in the picture above. This is the body of your Dad puppet. Cut out 5 rectangles for 2 arms and 2 legs...one is to attach the arms to the head and accordion body. For the feet...cut a circle and then cut that circle in half. Each half circle is a foot...glue them to the rectangle arms. For hands....trace your hands and paste them to the rectangle arms. To make a tie, cut out a diamond and a circle and attach them to the accordion body. For the head. Cut out a piece of paper 8" x 10" and glue it to the accordion body. Make half circle ears. And draw the features on the face. Use yarn, string, or paper for the hair. On the accordion body, you can write nice things to your Dad and use this as a card. You can also use it as a puppet if you tape yarn or ribbon to the back of your Dad's card. Tell your Daddy that he is the best of the best. Find a picture of yourself (or your Dad if you would prefer). Find a lid or cap that will fit around the picture. Then trace the lid around the face on your picture. Now use a scissor to cut the picture out...making it just a bit smaller than the line you traced. Glue it inside the lid or cap. Glue 2 ribbons, criss-crossed on the back of the cap. 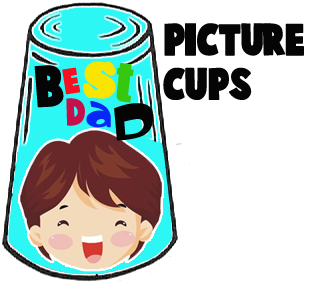 Paint 'Best Dad' or 'Top Dad' or '#1 Dad' on the ribbons. If you want this to be a magnet, glue a magnet on the back...if you want this to be a pin, then tape a safety pin on the back. 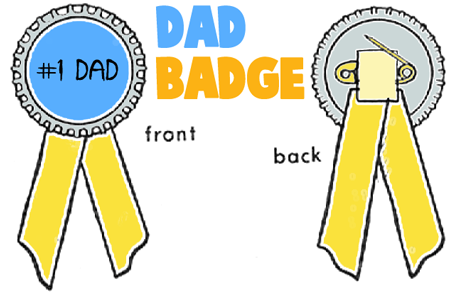 Your Dad will love wearing or showing off his badge of honor. Make your Dad a very special photo frame with the back of a styrofoam tray. Take a school picture of other photo of yourself that you are allowed to use. Trace around your photo on the tray and cut just inside that traced line (maybe about a quarter inch inside that line. Dot glue on the edge of the photograph's front side (as weird as this sounds)and then place the BACK of the tray onto the glue dots that you just made. Center the photo so it looks really good. Then the fun part. Decorate with lace, string, yarn, buttons, ribbons, shells, and other items. Your frame will look beautiful. Tape yarn, string or ribbon on the back of the photo frame so that your father can hand your frame. Make Your Dad a pencil holder or a plant holder for his office desk. Get some clothespins, rubber bands,soft copper wire, pliers, (optional) brown stain or shellac, (optional) brush, and a peanut can or similar sized can. Remove springs from clothespins. To do this, hold clothespin with both hands (see sketch a) and twist apart. 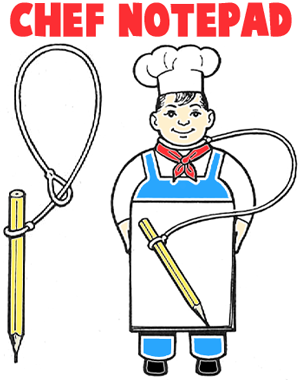 Place clothespin halves around can, with outside part against can (sketch b). (Use rubber bands to hold clothespins in place.) Wrap two strands of copper wire around clothespins, fitting one into top groove and one into bottom groove. Twist wire tightly with pliers to hold clothespins firmly in place. Optionally, stain or shellac barrel. When dry, fill barrel with dirt and add a plant. Or, use container as a pencil or trinket holder. Your Dad is the most special Man in your life and this gift shows him just as wonderful you think he is. This is a very easy craft to make, but at the same time shows that you care enough to make something special for him. All you will need is ribbon, and eye dropper / or glass vile / test tube, glue, pin, a wax crayon, and a flower. Your dad will be able to pin this flower vase to his suit's lapel to show off to his co-workers that he has the best child in he entire office. 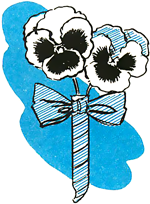 Find out how to make this suit lapel flower vase here. 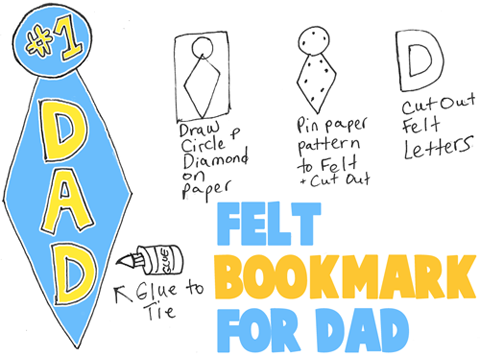 Make a special felt tie bookmark for Dads who like to read. All you have to do is draw a tie on paper by drawing a circle and a diamond. Then cut this out and pin it to felt. Then cut out the felt with the pattern. You now have the base for your felt tie bookmark. Cut out felt letters and glue it carefully to the felt. Let it completely dry and then give the bookmark to Dad for Father's Day. This is a great project for younger kids, such as toddlers, preschoolers, Kindergarteners, and other early grades. Firstly, lay down newspaper to protect your table top. On a piece of paper, put a strip of masking tape somewhere at the bottom of the page (this is where the child will write his or her name and age later). Then have the child place his or her hand on a piece of paper, above the tape. Get some paint and dip a toothbrush into the paint. Then either use your finger or a craft stick and then run the stick or your finger along the toothbrush to splatter the paint all around the child's hand. Do this with several different colors for an even prettier effect on the paper. When the page is covered.... let the child lift his or her hand and wipe off and wash his hands. When everything is dry....then write the child's name and age and 'Happy Father's Day'. If the child is old enough, have him do it himself. Staple or tape a ribbon bow to the top. This turns out to be a great crafts for your Dad. He won't be able to figure out how you got a big scene inside such a little bottle. Get a soda bottle or a water bottle. Remove the label with warm soap and water. Dry the bottle. The cut an oval out of the side of a bottle. Now take the plastic that was cut out of the bottle and lightly trace it on a piece of sturdy cardboard. 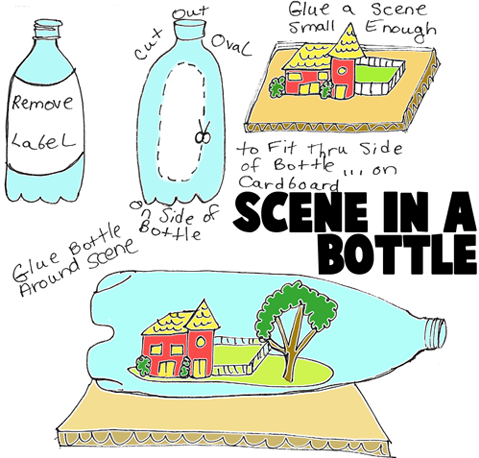 Make sure that your scene is made within that oval so that the bottle can fit on top of it. Now find a few miniature objects...such as a miniature house and tree. You could always make the scene out of clay or cardboard if you don't have any little toy figurines to use. Next glue the bottle around the scene and let dry completely. Give the scene in a bottle to your Dad for Father's Day. 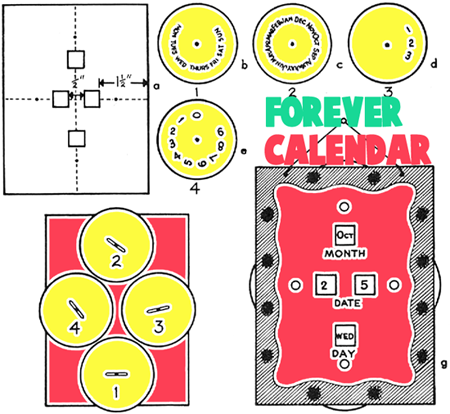 (Click on Above Image to Open up a Bigger Image) The crafts materials needed for this calendar are a piece of colored cardboard 41/2"x6", 4 colored cardboard circles 2 3/8" in diameter, four 3/8" paper fasteners, pencil, paint, paintbrush, paper punch, 10" piece of yarn or ribbon, and scissors. On the back of the 4 1/2"x6" piece of cardboard mark the center of all four sides. Draw lines connecting the centers of the opposite sides. Cut 1/2" square windows 11/2" in from all four sides (sketch a). Lines connecting sides should go through center of windows. Be sure to measure accurately! Then make a small hole with paper punch 1" from each side of the cardboard on the lines connecting sides (sketch a). Turn cardboard over and label the openings as shown in sketch g. Decorate as desired. Punch a hole in the center of each cardboard circle. Carefully divide one circle into seven equal parts (marking lightly in pencil) and print on the days of the week around the edge (see sketch b). Divide the second circle into twelve equal parts and print on it the months of the year. On the third circle print the numbers 1, 2, 3, as shown in sketch d. Divide the last circle into ten parts and print the numbers 0 through 9 around the edge. With a paper fastener, attach each circle in place on the back of the large cardboard as shown in sketch f, so that the number or word will show through the proper window. Punch two holes in top of calendar. Put one end of yarn or ribbon in each hole and knot on back side (sketch g). Make Totem Pole Mail & Notes Holder Gift for Dad’s Office on Father’s Day - This is a really cute idea to make a totem pole to hold letters and special notes. This would probably look really great in your Dad’s office…so why not make it for your Dad as a gift on Father’s Day? It is a tall totem pole of VIP’s handles letters, memos and notes. Find the instructions below. Altoids Tin Emergency Kits - Make a pocket kit for your dad on Father's Day. It can be an emergency kit, a a camping kit, a fishing kit, a sewing kit, or whatever type of kit you want. 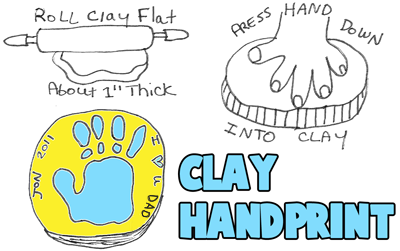 Make Keepsake Hand Print Poster Gift for Mom or Dad - Here is a cute arts and crafts project for kids to make for Mom on Mother’s Day or dad on Father's Day. Thumb Wrestling Puppets - Make thumb wrestling puppets to play with your dad on Father's Day. He will love these. Make Newspaper or Magazine Holder Rack for Dad on Father’s Day - This is an arts and crafts project that uses a cork and a wire coat hanger to make a great rack to hold magazines and newspapers. If your Dad reads a lot of periodicals (newspapers and magazines), then this might be the perfect craft to make for your Dad. Make Fish Pen and Pencil Holder for Dad's Desk to Show Him He is the Big Fish - Show dad that he is the Big Fish by making him this fish pencil holder for your desk. Organize all of those pens and pencils from his messy desk. Neck Tie Pencil Holders - Learn how to make these cute pencil holders with a neck tie for Dad. Pencil and Notepad Set - This is a great gift for Mom, Dad, Grandma, or Grandpa or basically anybody else. Find out how to make it. Paper Weaving Pencil and Pen Holder - Learn how to weave paper together to make a pencil and pen holder for a desk. Clothes Hanger Tie Racks - Your dad will love this tie rack for Fathers Day or his birthday. Find out how to make it. How to Make Tri-Fold Picture Frame from Cardboard and Felt - Most picture frame crafts are for one photograph, but this one holds 3 photos. This would be perfect to make as a gift for Dad or Mom for family photos…and it would look great on their office desk. 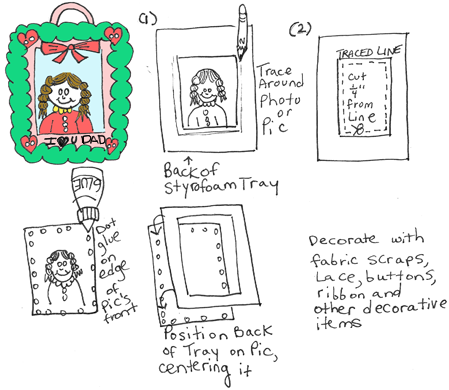 If you want to learn how to make a tri-fold picture frame, then look at the directions in this arts and crafts activity for children. Make Book Holder for Dad's Desk- This is a great craft to make for a gift book holder for Dad on Father's Day. Make Silhouette Self-Portraits for Mom or Dad - This will make a wonderful keepsake craft for Mom and Dad as they watch you grow up and get to see how small your head used to be in comparison to how you look now (when they look back on it years later). Handprints That Help with Chores -Your Dad will appreciate getting a promise from you that you will be more helpful in the coming year...these are helpful hands alright. 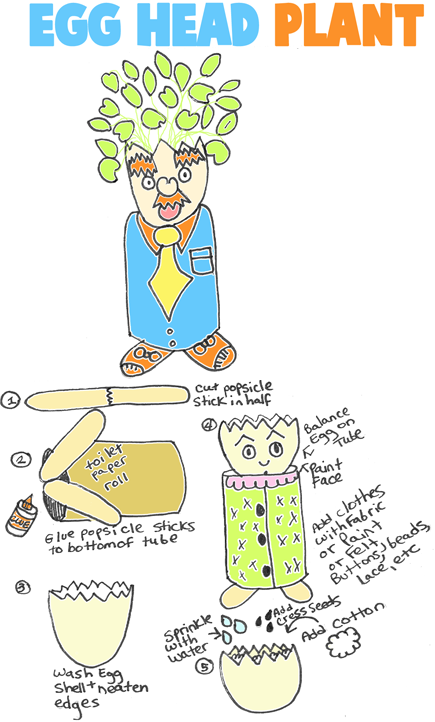 Make a Fathers Day Foam Chef Doll Gift for Dads Who Like to Cook - Does your Dad cook the best food? Does he love hanging out in the kitchen to cook you the best food? Don’t you think that your Dad is the world’s greatest chef? Show him what you think of her by making this chef doll out of foam for a Father’s Day present. The simple step by step instructions are given below. Make a Family Newspaper for Father's Day - This is a great crafts idea that will produce a keepsake to cherish in years to come. 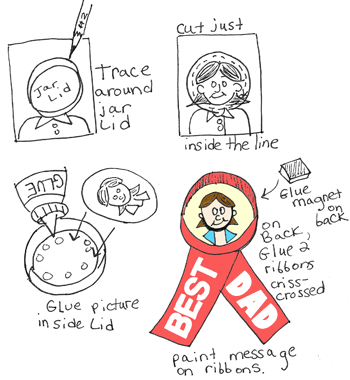 #1 Father's Day Badge Ribbon - Make a #1 badge ribbon that is made with cereal box, paint, and ribbons. Crafting a Milk Carton Pencil Holder - This is a very easy craft to make, so if you are short on time, here is an easy craft to make for Dad. 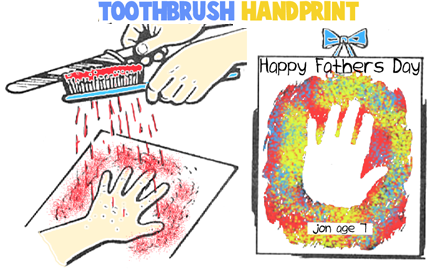 Loving Hands Fathers Day Card - Make this awesome Fathers Day Card with your own handprints and a lovely poem. Make a Mini Phone Book for Dad - Dad will love this, he can have a miniature little phone book or address book right in his back pocket or in his desk. he will love it. Leather Comb Cases - Learn how to make leather laced comb cases to carry your comb in. Great gift for Fathers Day. Pen Holder for Dad's desk- If you want to make a pen holder for your Dad's desk than this is a great craft...it is quite elegant. Whale of a Dad Note Spindles - Your daddy deserves a neat desk and you can give it to him with this note holder that you make out of plaster. How to Make Fun Bow Tie for Dad - Learn how to make this spunky bow tie for Daddy. 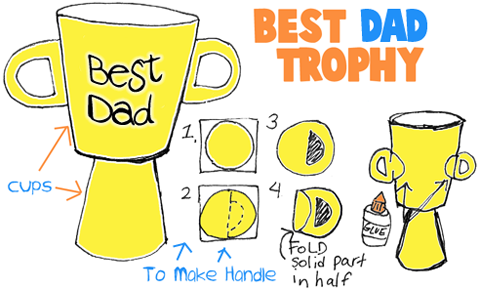 Best Daddy in the World Plaques - Use popsicle sticks and crafts letters to make a really cool plaque for dad. Belt Loop & Key Chain Wallets - Put it on your belt loop or put it on your keychain...either way, it is great to keep some money tucked away. Make for Mom or Dad. Photo Paperweights - What dad wouldn't love one of their children (or all of their children) on their desk as a paperweight. Cardboard Tube Tie Racks - Use paper towel rolls, tissue paper, and string or ribbon to make these tie racks for dad. Matches Safe for Camping - Make a matches safe from an old film cannister.